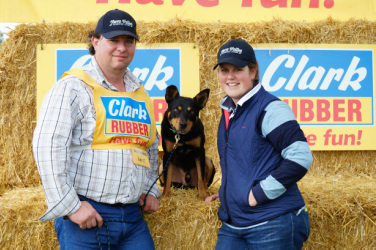 Yarra Valley Working Dogs is home to Steve Sudero and Taleigha Emmerson and their dogs. Steve's original background was training horses; but Steve also started training working dogs many years ago. Training dogs started to get a little more serious when he purchased Go-Getta Elly-May from Joe Spicer, at Go-Getta Kelpie Stud 12 years ago. This is when Steve started yard dog trialing; Elly-May has placed in the top 10 yard dogs in Victoria. Recently, Steve and Taleigha have started assisting unwanted working dogs. The dogs that come to the Yarra Valley are normally the ones that are difficult to handle for the average person or ones that show some working traits. We take in private surrendered dogs and we also work alongside several rescue organisations. All the dogs that come into our care are assessed for working ability and some of these dogs are further trained for stock work; whilst the others are adopted to pet homes. Both Steve and Taleigha enjoy competing in Yard Dog Trials with their own dogs, its a great time to connect with the resident dogs and enjoyable catching up with friends. Steve is also a committee member and training mentor for the Victorian Yard and Utility Farm Dog Association. Steve also assists people who are struggling with there own working dogs behavours.